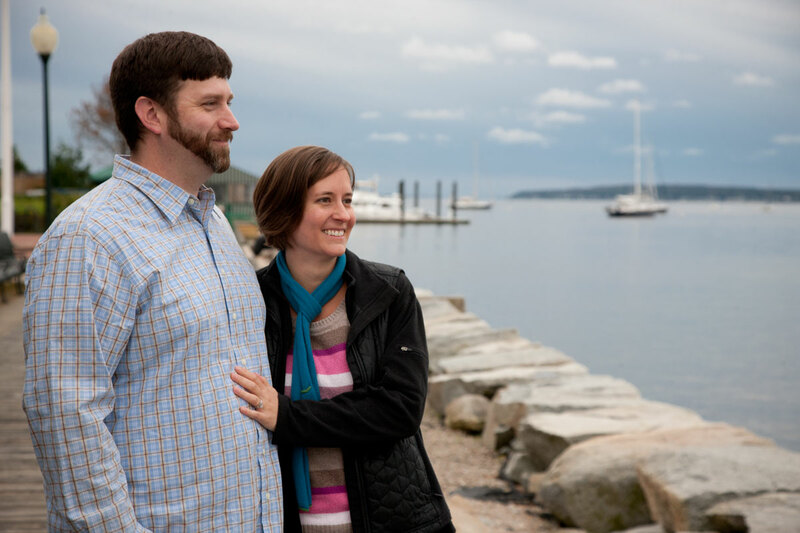 Listening to Sam and Kylie (Stemple) Pfile describe their lives in Rhode Island is something akin to hearing the story of the blind men and the elephant. Sam clearly misses the Midwest. But they both agree that they moved to the East Coast to see what it was like. Kylie (’03 art & design) grew up in Council Bluffs, Iowa; Sam (’01 ag business) was born in Mason City, Iowa, but grew up in Illinois. They met at Iowa State when Sam transferred from a junior college. “I did a college visit, and after five minutes on campus I said, ‘I’m coming here,’” Sam says. “We lived on the same floor in Larch Hall,” Kylie says. Sam, you will not be surprised to learn, is eager to move back to the Midwest someday. Kylie is in no particular hurry. Jim and I spent the day with Sam and Kylie (and Gus, who doesn’t seem so much spoiled as just really happy) at their Riverside, R.I., home (not far from Providence) last October. The couple has the distinction of having completed all 50 states on the Wall of Alumni and Friends at the ISU Alumni Center when they purchased a wall plaque after meeting ISUAA president Jeff Johnson at the ISU vs. UConn game in the fall 2011. Rhode Island is the smallest U.S. state, the state with the fewest ISU alumni, and, until they purchased the plaque, the only state not represented on the wall. Shawn Kyne could never envision himself with an office job. And boy, did he get his wish. 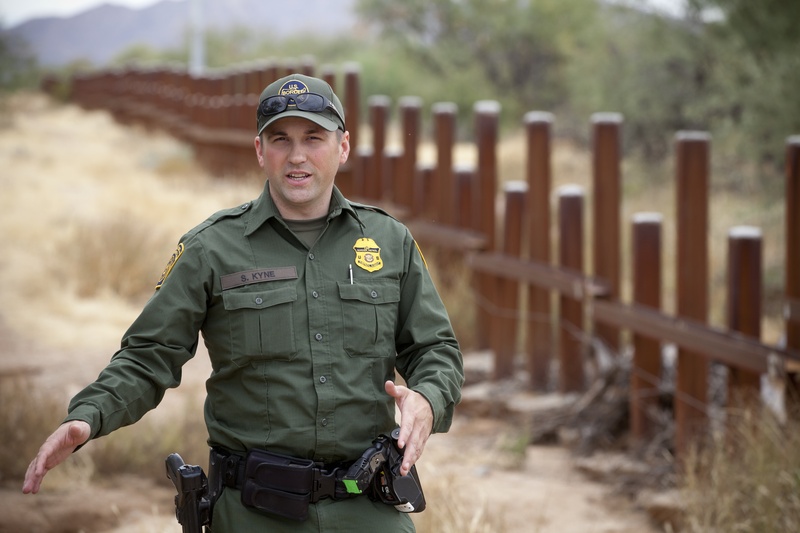 As a U.S. Border Patrol agent, Shawn helps patrol the western corridor of the Tucson Sector made up mostly of the Tohono O’odham Nation, an Indian reservation roughly the size of Connecticut. It’s an intense, active job for the 2005 political science grad from Minnesota who says he was always interested in law enforcement. The area Shawn patrols in southern Arizona is mountainous and sparsely populated, with rugged terrain and a harsh climate. There are tarantulas, rattlesnakes, scorpions, and plants that sting and poke. Often the people he encounters crossing the border illegally from Mexico into the United States have been walking for five days or more. Indeed, Shawn says no two days are ever the same. At the heart of his work is tracking: using skills both simple (following tracks, looking for disturbances on the ground) and high-tech (thermal imaging, GPS, ground sensors). He says the Tucson Sector is one of the most active sections of the border, with people trying to cross into the country illegally every day, on every shift. And the smugglers are getting more sophisticated – but so is the Border Patrol. “We have more agents on the ground and access to more technology than ever before,” he says. In the photo above, Shawn is standing by the border fence. 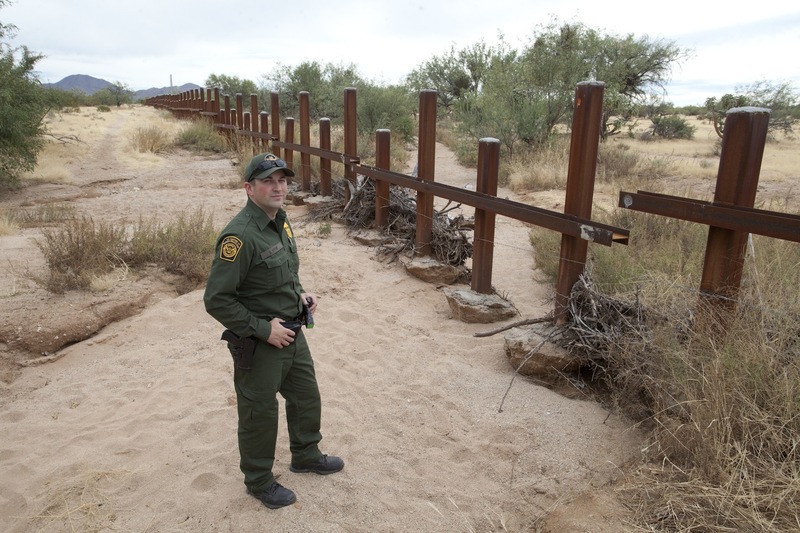 Part of the fence that runs along the U.S./Mexico border in the Tucson Sector of Arizona is a simple vehicle barricade – you can easily walk across the border here, but not legally. He explained that technology allows agents to detect crossings in these remote areas and arrest those who attempt to enter the country illegally. Shawn told photographer Jim Heemstra that if he walked into Mexico and crossed back into the U.S., he would have to arrest him. And he wasn’t joking. More than 320,000 people gathered in Las Vegas last summer for one of the largest music events in North America: The Electric Daisy Carnival. For three nights, fans were entertained by more than 150 musical acts, 500 theatrical performers, and 12 large-scale interactive installations and pyrotechnic displays. Alison Monaghan (’05 journalism/mass communication) was there. A senior account executive for Kirvin Doak Communications in Las Vegas, Alison worked through the night, making sure the needs of the media and the artists’ publicists were being met. Electric Daisy Carnival (EDC) is a year-round account for Kirvin Doak, and Alison handles the publicity aspects of the mega-event. Alison works not just with EDC but with other clients including those involved in Las Vegas entertainment, nightlife, resorts, and real estate. (Once, a story she pitched about bilingual casino dealers made it on the front page of the New York Times.) She also works for clients in the nonprofit world, specifically with the Justin Timberlake Shriners Hospitals for Children Open, a golf tournament in the fall series of the PGA Tour. 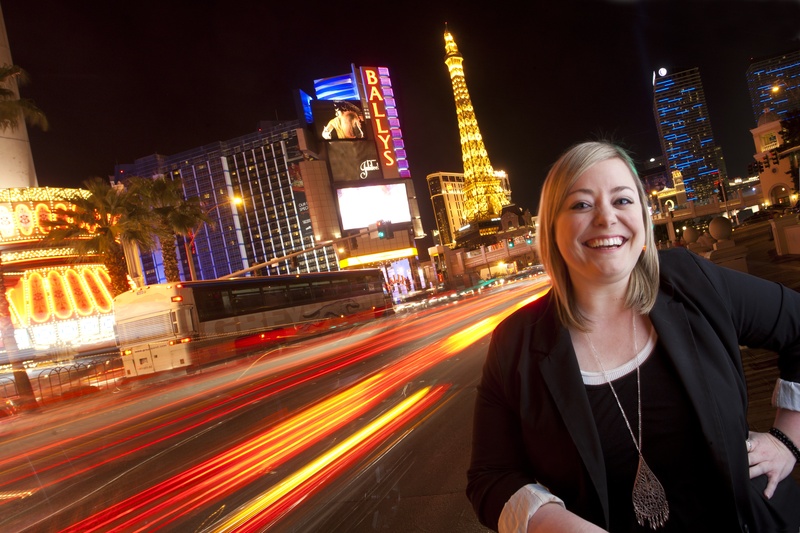 The Las Vegas strip is a world away from Alison’s rural hometown of Guthrie Center, Iowa. After she graduated from Iowa State, Alison knew she wanted to travel and live in a big city in a different part of the country, but she wasn’t sure where. She asked herself: “Where can I move to be on my own and prove I can do it?” She sent resumes to New York with no luck, then moved to San Diego. From there, she was told that Las Vegas was the best place to get a job in public relations. Alison gambled and won. She’s been in Las Vegas for six years now, and she’s in no hurry to move on.